California Is First State To Set Energy-Efficiency Limits For Computers : The Two-Way The California Energy Commission approved standards for the amount of energy computers and small servers can use when they are on, off, idling or asleep. The rules will roll out between 2018 and 2021. 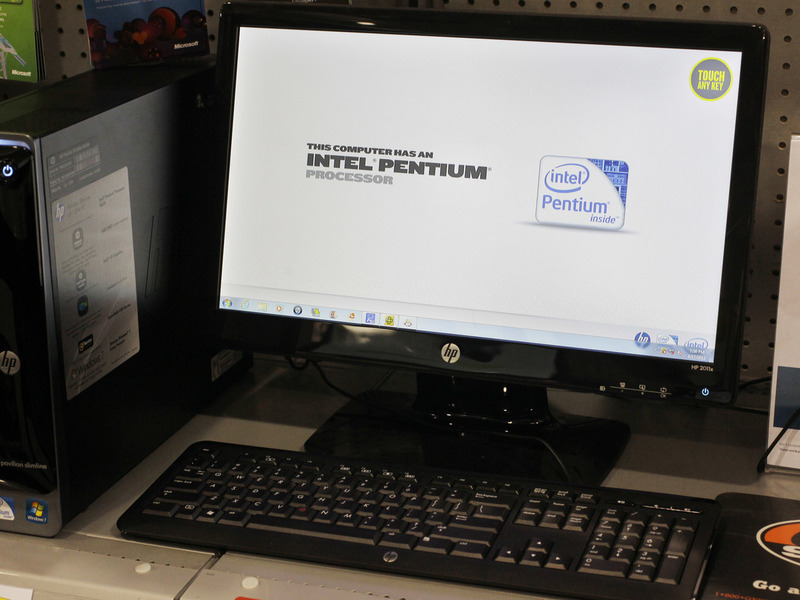 An Intel advertisement on a Hewlett-Packard desktop computer in 2012. California is the first state to adopt efficiency standards for computers and monitors, the state's energy commission announced this week. The commission approved regulations that limit the amount of energy computers and small servers can use when they are idling, asleep or turned off. The regulations for monitors will also limit the amount of energy the apparatus uses when it is turned on. "It's common sense that electronic equipment ought to consume a minimal amount of energy when it is not being used," energy commissioner Andrew McAllister said in a statement. The commission estimates computers and monitors in the state use more than 5,600 gigawatt-hours of electricity. That's up to 3 percent of residential electricity use and 7 percent of commercial use. The limits will go into effect over the course of three years, starting with regulations on small-scale servers and office workstation computers beginning Jan. 1, 2018. When all the regulations are in effect, the commission estimates the electricity cost savings for the state "could save consumers an estimated $373 million annually." The regulations will cause the prices of computers and monitors to go up, the commission acknowledges. It estimates laptop computers will increase by $1, and desktops by less than $10. Most laptop computers already comply with the new standards, according to a commission report. Monitors will go up by about $5 and workstation computers, which are usually more expensive than regular desktops, are expected to increase in cost by about $13. The commission believes the overall savings, if consumers factor in the energy costs of owning a less energy-intensive machine, will outweigh the upfront price increases. The San Diego Union-Tribune reported that while the regulations apply only to computers in California, "the sheer size of the state's share of the computer market is so formidable — California by itself accounts for 25 million computer monitors, 23 million laptops and 21 million desktops — the new standards will have ripple effects across the country and beyond." "It will have a global impact and significantly change the way future energy-efficient desktops and all-in-one computers are designed and manufactured," Andrea Deveau, vice president at the trade group TechNet, told the paper. TechNet's members include Hewlett-Packard, Apple, Cisco, Microsoft and Google. "It was never taken lightly and it is definitely an historic rule-making," Deveau said. There is no mandatory federal energy efficiency standard for electronics. Since 2009, a joint Environmental Protection Agency and the Department of Energy program has offered a voluntary efficiency certification known as Energy Star. That program includes optional standards for computers. A spokesperson for the California Energy Commission, Amber Pasricha Beck, told NPR the new state regulations for 17- to 20-inch monitors are slightly more stringent than the most recent Energy Star standards, and significantly more stringent for 20- to 30-inch monitors. As for desktops, where the state hopes to make the most significant energy efficiency gains for computers, the baseline state standards are more stringent than the voluntary federal standards, Beck said. For notebook computers, the state and current federal standard are about the same.